The peloton heads back to Italy after a travel day. The fourth stage winds across the undulating hills of southern Sicily. The route includes two categorized climbs, and many other uncategorized ascents, including the final climb to Caltagirone. Will it be a bunch sprint or a small group? The climb will dictate the outcome. The course then runs across the town center, skirting famous places such as the stairs of Santa Maria del Monte. 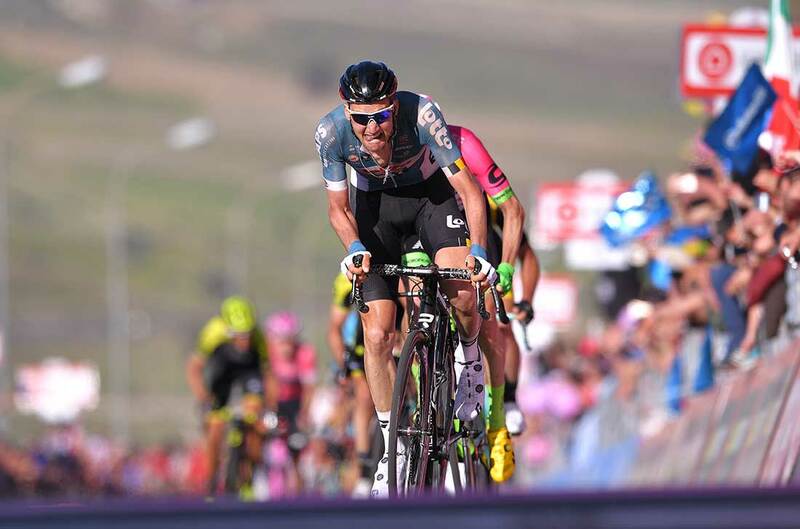 The Italian motherland welcomed the Giro d’Italia’s return Tuesday with a tricky, hilly run through Sicily, won by Tim Wellens out of a small group in Caltagirone. Canadian Michael Woods (EF Education First-Drapac) was second to Lotto Fix All’s Belgian. Enrico Battaglin (LottoNL-Jumbo) rounded out the stage 4 podium in third. Rohan Dennis (BMC Racing) kept his overall lead after the 202km race. Simon Yates (Mitchelton-Scott) moved up into third overall with a fourth-place result on the day. Pre-race favorite Chris Froome (Team Sky), on the other hand, lost 17 seconds to his rivals up the final climb. 2. Michael Woods (Team EF Education First-Drapac), s.t. 3. Enrico Battaglin (Team Lotto NL-Jumbo), s.t. Edoardo Zardini (Wilier Triestina-Selle Italia) kicked off the action in the final 10 kilometers of racing, soon after the remnants of the early five-man breakaway was caught. Valerio Conti (UAE Team Emirates) followed his Italian countryman’s move right away on a short climb, one of many in the hilly route. However, before long, Conti attacked and went alone off the front. His escape was aided by a big bottleneck in the peloton, just inside of 7km to go. The crash wasn’t major, but the bunch funneled into a narrow road, bringing the back half of the field to a standstill. Eventually, with around 3.2km remaining, the peloton caught Conti. The route got technical into the final few kilometers, twisting through the narrow streets of the finish town. Maximillian Schachmann (Quick-Step Floors), leader of the best young rider classification, came to grief in one of those bends. However, he managed to keep the jersey after mounting a quick chase to the finish. As the peloton accordioned through the bends, four riders snuck off the front. Their move wouldn’t last on the grinding, short climb to the finish. Battaglin led out the sprint early, about 300 meters from the line, once the race had regrouped. Wellens was right on his wheel and opened up his sprint with Woods on his wheel. The EF rider put up a good fight but couldn’t come around Wellens in the finale. Although the Belgian is only 19 seconds back in the overall, he said he’s not trying to seize the maglia rosa. Wednesday’s stage 5 from Agrigento to Santa Ninfa should offer another hilly race, albeit shorter than stage 4 at 153km. 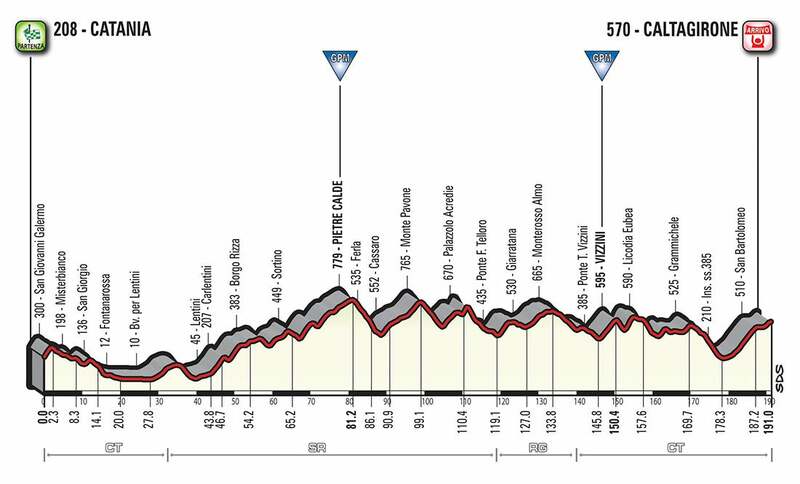 The riders face Mount Etna on Thursday. “Of course I’m very happy. It relieves us from the stress. Now we can go easy for the rest of the Giro, and often when you don’t have stress, everything comes easier,” Wellens added.